It seems that every time I go to the range the weather conditions give me an excuse for less than perfect marksmanship and this range test was no exception. Just to make it clear, this was probably the windiest day I have ever had at the range. You can see from the flag below, the wind was harsh. At times, the wind force was hitting my body and I could see my crosshairs move on the target. The good part was that most of the time the wind was hitting me in the face (not a cross wind). Enough with the excuses, now for the review. I borrowed the Rock River Coyote Carbine from my brother-in-law and he had already taken it to the range twice, both times were with cheap plinking ammo. For my range tests, I did bring some more plinking ammo (Wolf 55 grain FMJ), but I also got a couple of boxes of Buffalo Bore Sniper 55 grain and 69 grain ammo. I was extremely pleased with the results I got with the Buffalo Bore Sniper .308 ammo with my FNAR review, so it seemed natural to test out their .223 Sniper ammo. I started off shooting with the Wolf ammo and had to adjust the scope slightly since I had removed it for the rifle review. Also I used this ammo to get a better feel for the trigger pull and to make sure my rest situation was good. Next I switched to the Buffalo Bore Sniper 55 grain ammo. I shot two 3 shot groups. One measured 1.50" and the other 0.83" shown below. While looking through the scope, I was pleased with the results so far considering the windy conditions. As I started my next three shot group with the 55 grain ammo, I had my first of three rifle jams. The photo below shows the jam. Each time the rifle seemed as if the bolt was not extracting the brass and then was trying to send another round on top. The first two times I removed the magazine, closed the bolt firmly and ejected the brass. I removed the bolt and carrier and cleaned the rifle. On the third time, it did the same thing. This time I had to use a cleaning rod down the barrel to assist with the brass removal. It wasn't that the brass was hung up in the chamber, it was that the bolt carrier seemed to be dragging. Again I disassembled the rifle and this time I found a small piece of metallic trash (primer-ish looking) in the bolt carrier. I reassembled the rifle and it functioned flawlessly throughout the rest of the tests. I still don't know how that trash got in the carrier assembly. For now, I'm going to have to take the blame and assume that my cleaning efforts were not up to par. Since this was not my rifle, and just to play it safe, I decided to forgo shooting the rest of the Buffalo Bore 55 grain ammo. The last thing I wanted was to return a problem back to my brother-in-law. I then switched to the Buffalo Bore Sniper 69 grain ammo. Using this ammo, I shot five 3 shot groups. These groups measured 0.55", 0.90", 1.10", 1.28", and 1.50". The average group size was 1.07" with my best group shown below. Just to run some more ammo through the rifle and make sure the scope was where it should be for plinking ammo, I shot another six 3 shot groups with the Wolf ammo. The groups were 1.16", 1.28", 1.45", 1.47" 1.53", and 1.76". This average group size was 1.44" which is probably respectable considering the cost of the ammo. I don't think the rifle jam was due to the rifle or the ammo, but instead some type of metallic particle in the bolt and carrier assembly. It functioned perfectly throughout the remainder of the tests. Do I think this rifle is 3/4" MOA capable? 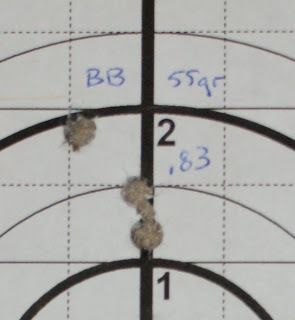 I had one group very close with the 55 grain Buffalo Bore ammo and one with the 69 grain Buffalo Bore ammo that clearly shows the rifles potential. My average group size with the 69 grain ammo was 1.07". Considering the windy conditions, I believe I could do better on a calm day and this decrease in accuracy from 3/4" to a little over 1" can be easily accounted for by the windy conditions. I am curious if your shot groups each got exceedingly bigger or are you just listing them in order of size? These groups were listed in order of size, not the order shot. Also, I believe the 55 grain BB ammo was too hot and that caused the case to swell and pop the primer out. I bought its cousin the ATH model (ordered 16 inch barrel which they will do on request). I felt the gun was somewhat better fit wise compared to my brothers S&W MP15T. Accuracy wise, it seems to be capable of 3/4 MOA or a bit better with match ammo or hand loads. Its a beauteously done gun. My only problem was the gas block screws came loose, and I did not catch the problem until I got it home. The two set screws were very loose, gas block had moved forward. I have written RRA. I am not impressed with their manual (My XCR has a really good one). Case is good, stock is good. Did not come with witner trigger guard as advertised (email sent). Gas key was staked "good" on one side and "excellent" on the other side. I thing its a terrific gun, I am shocked the gas block screws were not secure nor had any lock tite of some type on them. I shoot a Bushmaster M4 and I tried the wolf ammo and it made the gun jam my rule of thumb is never buy wolf. I trust Federal cause it shoots right and I haven't had my gun jam since. Rock River Arms rifles are every bit as accurate as the gauarentee. The catch is you have to use equivalent quality ammo. Wolf ammo won't shoot well in any rifle. I PROMISE YOU if you get your hands on some black hills 77 grain match ammo you can stack shots on top of each other. Honady tap is another accurate round that is a little less expensive. I hand load my ammo for my RRA rifle and its has never failed me yet.